I struggle with productivity everyday. No one. Which logically means that our employees, like every other person on earth, struggle with productivity. Now imagine that you run a business with 10, 50, or a 100+ employees – how much is low productivity costing you? After all, if you’re spending $30k a month on salaries, as we were at NinjaOutreach, then in theory doesn’t increasing employee productivity by a mere 10% save the business $3k per month? Hence the scope of the problem, and why employee productivity (as well as your own) needs to be on the forefront of your mind. Salaries are often a company’s biggest expense, and maximizing your employees’ productivity is the easiest way to cut costs. Work on your team culture and spirit. Communicating effectively, and making sure your employees understand your project or task requirements. Pro Tip: Get your employees to video themselves doing a task, watch the video, make notes on how they could do it faster, and send your notes across to them. First, carry out a productivity audit to measure current productivity levels. Next, eliminate or reduce the productivity killers in your office. Third, use the appropriate resources to equip your employees with the skills they need. Last, review your standard company meetings, and try and optimize them as much as possible. Say you get rid of a subscription that costs you $10 per month. That means you’re saving $120 a year. $120 is cool, but think about it: salaries are often a company’s biggest expense. If you can increase the productivity of your team, and get more done with less, you’ll be able to hire less people to get the job done. Which means more money in the bank. Now that you know how important it is to make productivity your endgame, let’s move on and talk about what kills productivity! These five things are the absolute worst for productivity. If you want your employees to be at the top of their game, then it’s time to make your office more conducive! Imagine you sit down at your desk, pull out the report that you were hypothetically working on yesterday, and just as you’re about to get started, a co-worker pops by your desk, and asks if you wanna head out to get coffee. Reluctantly, you accompany your compañero for a cup of Joe, and when you get back to your desk and pull out that report again, you’re interrupted again. This time it’s Skype. An hour later, your finally done ironing out all the details of the presentation and go back to your report. But now, your email provider chimes five times in quick succession, and switching over, you realize you have five emails from their client, all of which are marked “URGENT”. It should, because as it turns out, it’s very common. According to this survey, a whopping 71% of 6,000 respondents indicated that they get interrupted frequently throughout the day. To make matters worse, it takes (on average!) 21 minutes to regain your focus after an interruption. So how do you help your employees minimize interruptions in their workday (and maximize productivity)? First, tell them that they don’t need to attend to every single request right off the bat. Yes, this is common sense, but your non-confrontational, introverted employees will probably feel more comfortable saying “I can’t do this right now, but let me get back to you” if you’ve explicitly told them that it’s okay. Next, get your employees to assign themselves mini-deadlines throughout the day. Without these mini-deadlines in place, your employees might unwittingly get sucked into a call which takes up 1.5 hours of their precious time. But with these mini-deadlines looming over them, they’ll be forced to cut the conversation short, and get back to work. Last but not least, teach your employees to batch up certain tasks, such as replying to emails. Here’s the thing: if your employees pull themselves away from their work and turn their attention to their email every single time they get a new email, their workday is going to be super fragmented. Productivity will nosedive, for sure. So get your employees to block out certain times on their schedule where they can reply to their emails, all in one go. For more details, check out this guide on batching your emails. While you’re at it, take a look at this list of 11 best Chrome extensions for companies using Gmail as well! They’re often ineffective and state the obvious. Holding a 1 hour meeting involving 10 people is actually taking up 10 hours’ worth of time. 10 hours is a lot – it’s an entire day for one person. Of course, the answer to this isn’t simply eliminating all your meetings. That’s not feasible! Instead of this, structure your meetings properly, so that they start on time, end on time, and you achieve everything you want to do within that period of time. First, send out a meeting agenda at least half a day in advance. This agenda should include the required attendees, meeting objectives, discussion topics, and a start and stop time. Here are a few templates for you to choose from. With this agenda, your employees will be able to prep for the meeting, which means they’ll speak up and participate more during the meeting. When you’re in the meeting, keep your agenda up on the screen or board – this keeps everyone focused, and on track. Psst: if you’re trying to come up with an agenda, and you realize you don’t actually have that many items to discuss, then don’t hold the meeting! If you can get away with sending a mass email, or holding an informal discussion over Slack, do that. Second, set a clear end time for your meetings (and make it 15 minutes earlier than what you think the end time should be). If you allocate too much time for your meetings, you’re doing yourself a disservice. Your attendees are more likely to amble in late, set up their laptops slowly, and go off topic. When you only have a short period of time to work with, on the other hand, this forces everyone to concentrate. On that note, try to avoid having meetings at the end of the day, when people are winding down and getting ready to leave work. Meetings held right before lunch are a no-no, too – your employees might be too hungry and distracted to focus on the tasks at hand! Third, involve only people who need to be there. This one’s fairly straightforward – getting someone whose involvement isn’t required to sit in on a meeting is a massive waste of time. If you want them to be updated on what’s going on, just send them the minutes after the meeting is done! Again, if a single attendee shows up five minutes late, they’re wasting five minutes of everyone else’s time. So make sure you discourage latecomers! One way of doing this is to ask them to contribute $10 to the company’s Happy Hour fund. You could also ask these latecomers to explain why they’re late in front of the whole team, and make them squirm for a bit. Fifth, if someone is giving a presentation during the meeting, let them know that they’re not to read off their slides. If your employee is simply reading from their slides, word for word, then it makes more sense to email everyone those slides and let them digest it in their own time (instead of holding a meeting). Psst: if your employees need some help with their presentation skills, get them to check out this guide! Sixth, ensure that everyone is participating. Hands up if you’ve ever caught an employee daydreaming, sleeping, or doing other work at a meeting. (Or if you’ve been that employee). If you let your employees get away with these things, then your meetings won’t be as productive as they could be. Don’t be afraid to call your employees out, and keep the meeting on track! Last but not least, wrap up with action items and next steps. The goal is to keep the momentum going, and ensure that your employees are accountable. 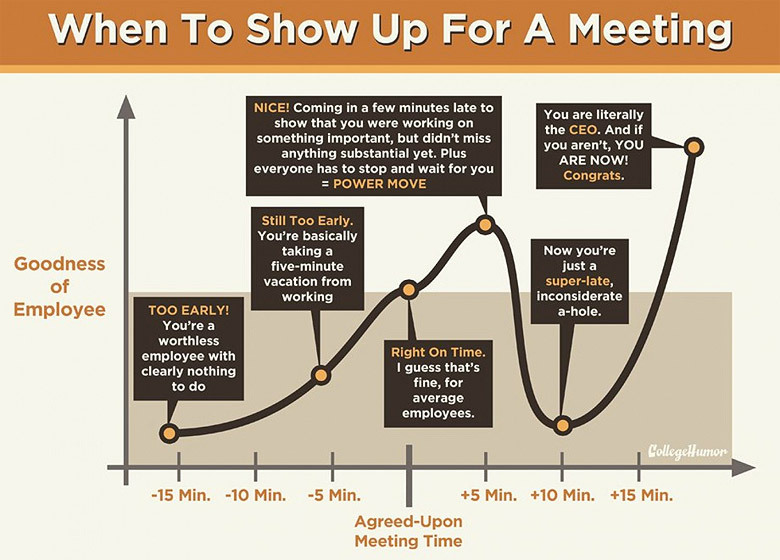 This way, you can easily pick up from where you left off when you have your next meeting! It takes a person with an amazingly strong willpower to not cave and check their social media feeds in the middle of the workday. If you want to increase employee productivity, make things easy for them. Contact your Internet Service Provider, and have them block these social media sites. then it might be a better option to teach your employees how to use apps that block social media sites selectively, and have them program these on their own. Here are a few tools that might come in handy: Chrome plugin Work Mode, SelfControl (available only for MacOS devices), Cold Turkey, WriteRoom (again, for MacOS users), WasteNoTime and StayFocusd. Take your pick! A recent article published on Linkedin estimated that a startup comprising of a 100-person team in Silicon Valley would lose $578,000 per year by switching from a traditional office to an open office. Yikes! Open offices are helluva trendy these days, and some business owners swear by it. I concede that open offices are great for collaboration, but guess what? They’re also horrible for productivity. If you’re employing a team solely to ideate and bounce ideas off each other, then by all means, have your open office. But most employees don’t work on collaborative tasks all day. They might have a one or two-hour block in which they have discussions, but they’ll probably spend the rest of their time writing reports, or optimizing ads, or fine-tuning campaigns. And they need peace and quiet in order to do these properly. Now, we’ve talked about how frequent interruptions kill productivity, but this isn’t exactly the same thing. Even if no one interrupts your employees, they’ll still have to deal with all the noise and general chaos that comes with an open office. …and companies with low employee engagement scores see, on average, 18% lower productivity and 16% lower profitability. Now, engagement is a term that business coaches and consultants throw around all the time. 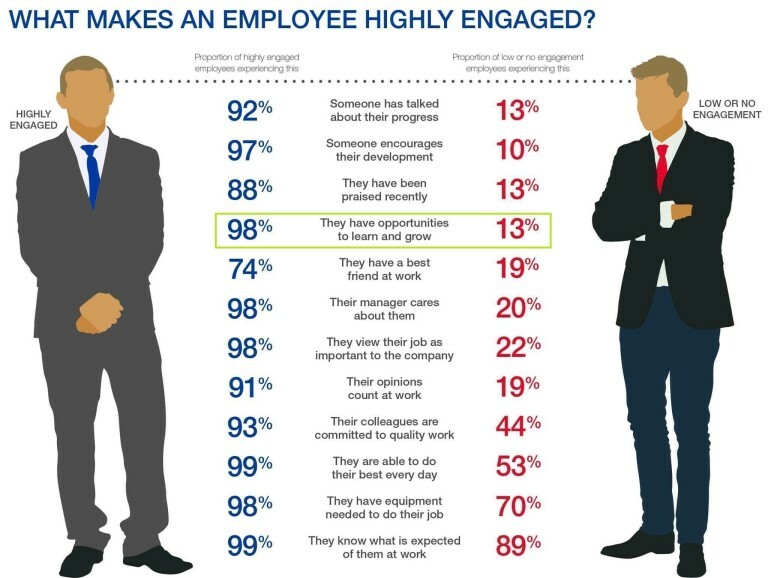 But what makes an employee highly engaged? If these questions were asked of your employees about your company, how would they respond? Make sure you work on your company culture, and implement activities and programs to keep your employees happy and motivated. You’re now an expert on what kills productivity… that’s half the battle won! Now, let’s move on to the techniques which will help you increase productivity. 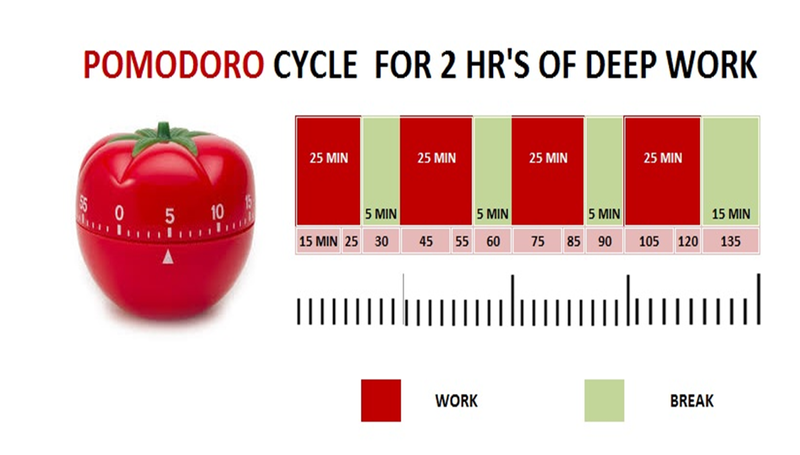 The Pomodoro technique is based on the idea that taking frequent breaks will help keep you productive. Here’s how it works: you work in 25-minute intervals, and take a five minute break after each 25-minute burst. After four of these 25-minute intervals, you earn yourself a 15-20 minute break. You might be wondering: what makes 25 that magical number? Is it okay if my employees work in longer or shorter intervals? The answer to that is… yes, it’s totally fine. While many productivity specialists recommend the Pomodoro method (so, 25 minutes), other studies show that the most productive employees tend to work, on average, 52 minutes before they take a break. There’s no hard and fast rule here! Have your employees experiment a bit, and let them figure out what works best for them. As long as they’re taking breaks every so often to lengthen their overall focus, they’re on the right track! Psst: these Pomodoro timer apps might come in handy. The Getting Things Done (GTD) method was popularized by productivity consultant David Allen back in 2001. This is a way of structuring your to-dos and schedule such that they’re more manageable. With GTD, it’s easy to see all your tasks at a glance, and decide what to work on next. For those who want to get started with GTD, you’ll have to familiarize yourself with its five pillars. These are: capture, clarify, organize, reflect, and engage. First, capture refers to listing down anything that’s on your mind. This doesn’t just apply to your to-dos; you should also be noting down your ideas, your recurring tasks, and anything else that’s taking up brain space. You can use an app, Todoist, or an old-school notebook. Choose the method that’s easy for you, so that you actually stick to it! Next, you’ll need to clarify the things you have to do. If your task is “Plan anniversary celebration”, for example, this really should be broken down into sub-tasks such as “Order flowers”, “Decide where to eat”, “Make a reservation”, etc. The idea is to have your list be comprised of small, bite-sized items so that you reduce your barrier to getting your tasks done. On that note, if there’s anything that you have the time to do immediately, go ahead and do it so as to get it out of the way. Next, it’s time to organize each item. Taking the item’s priority into consideration, assign due dates for each of your items, and set reminders so that you’ll remember to follow up. Psst: Trello is an amazing tool which comes with a nifty due date feature. The next thing you should do is reflect on your to-do list. On a day-to-day basis, look at your list to figure out what your next task should be. (Given that you’ve already assigned deadlines and prioritized your items previously, this should be really easy to do). On top of that, you should also give your to-do list a review every so often (try doing this once a week). Here’s a full set of instructions by David Allen. During your review, sit down and ask yourself: Am I making progress? Do I need to adjust my priorities? How can I make the system work better? The final step is to engage, and get down to work. That’s all there is to it! Another way of increasing productivity? Make sure your employees are well-equipped in the skill sets that they need to do their jobs well. If your employees deal with Excel a lot, ensure that they have adequate Excel skills. If your marketing team constantly works with PowerPoint, then get them up to speed in this area! For repetitive, manual tasks that can’t be optimized, try searching for an automated tool that can get the job done. Here are a few of my personal favorites: FollowUp, Hootsuite, IFTTT, Spext, Magic Spreadsheet, and Faster Image Insert. 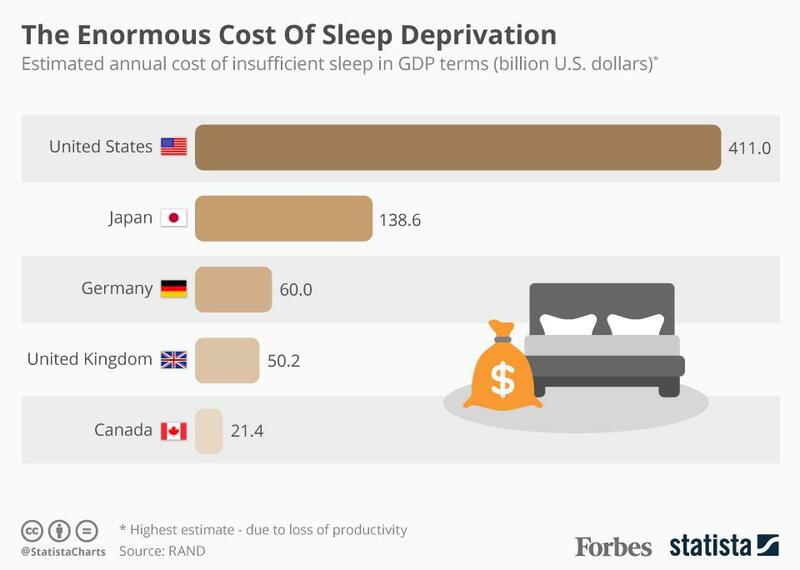 …and this is costing the economy a whopping $411 billion in lost productivity. First, have your management team plan ahead. Always know what your sales goals and whatever activities you have in the pipeline for this year / quarter / month, so that you won’t have to dump a ton of work on your employees at the last minute. Second, remind your employees to go on vacation. If your employees are that dedicated to the company, and they don’t want to take any time off, make this mandatory! Third, have your managers reach out to employees who are struggling. If these employees really can’t cope with their workloads, it might make sense to shift them to another department where they’ll be able to work more effectively. Fourth, teach your team to install apps on their desktops or laptops that will filter out the blue light. (This lets them fall asleep more quickly after they power down their devices.) F.lux is a great choice. Last but not least, encourage self-care! If your employees don’t dare to cut their workday short and head to the doctor despite the fact that they’re sneezing every two seconds, then you’re doing it all wrong. The way I see it, communicating with your employees is an art in itself. On one hand, you want to be concise, and not include any extraneous information in your directions to your employees. This is especially important when you’re speaking to foreign employees who might not have the best command of English. On the other hand, you want to be thorough and clear as well. Let’s say your employee gets started on a project, and then realizes they don’t have sufficient information. They’ll have to put the project on hold while they reach out to you to clarify, which isn’t being very productive! So how do you communicate effectively with your employees? First, provide them with bonus material if necessary. I’m talking about sales manuals, style guidelines, and all that good stuff. Second, don’t rely on ambiguous statements – such as “I’d like the copy on the brochure to jump out at me” or “make the PowerPoint slides pop”. Your employee isn’t a mind-reader, and they won’t be able to deduce what you want. Instead of doing this, have them look at a brochure / PowerPoint deck which you like, so that they may use it as a reference. Once you’re done briefing your employees on a task or project, get them to paraphrase the gist of it, and repeat it back to you. This way, you can make sure that you’re on the same page. Before you get start increasing employee productivity, you might want to check where your team currently stands with productivity. And if you don’t want to subscribe to yet another tool, you can always DIY the process. First, get your employees to video themselves doing a task that they do often. Watch the video, make notes on how they could do it faster, and then send them those notes. Simple enough! After this crash course on productivity, you should be all ready to swoop in, and take your team’s productivity off the charts! Review any standard company meetings - are they all necessary and does everyone need to be there? Here’s to doing more with less! How do you keep productivity levels high at your workplace?